A week or so ago I had the great privilege of reading DON'T SLEEP THERE ARE SNAKES by Daniel Everett. 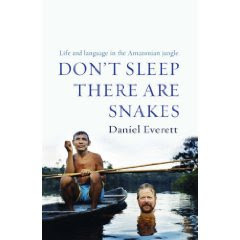 Daniel Everett, a young missionary, goes to live with a small remote tribe of Piraha Indians in the Amazonian jungle. He is there to learn their language in order to translate the New Testament. But he doesn't go alone, and this, really, is one of the more remarkable features of the story: he goes with his three young children and wife. Within weeks the wife and eldest child are seriously ill - and his story of how he manages to find somewhere for them to be treated is extraordinary. They almost die - and yet as soon as they are recovered they all return to complete their mission. There are lots of fascinating insights into the unique Piraha Society. They live exclusively in the present and their language reflects this. Daniel Everett finds that they have no words for number, and their words for colour are not abstract terms like ours, but similes. They view death with a nonchalance that can be chilling: when a young mother goes into labour, and her baby is breech, she is left to die alone; and when intoxicated with liquor by a conniving Brazilian trader they seem to consider carrying out his suggestion to kill the family without much of a qualm. But there is a positive side to their life too, and it turns out to be a very important one: the Piraha are generally happy. One anthropologist says they are the happiest people he has ever seen - because they live for today they have no word for worry. Eventually, Daniel Everett completes his task, and returns to the Pirahas with his version of the New Testament in Piraha recorded onto tape. However, the only person this seems to convert is Daniel. Usually I ask just two sets of seven questions - but Daniel Everett's book fascinated me so much that I'm afraid I gave into my curiosity and asked many more - and he very kindly and generously answered them all. DE: Three of them: when each of my children were born. DE: In 1968 I gave up doing drugs to become a Christian and train to be a missionary (I was 17). That has led me down the path of turns and switchbacks that has transformed my life in unexpected ways, by bringing me to the Pirahas. DE: Personally it was the death of my mother when I was 11. Less self-centeredly it is anytime I hear of the death of children in wars. DE: Waking up pleased to be alive. (Many) questions about DON'T SLEEP THERE ARE SNAKES. CD: Do the Piraha know how many children they have? When they share out their food, if they have discrete numbers, are they able to do that? DE: They do not know how many children they have, but they know them all by name and know if they are present or not. They share food by giving out generous portions until they run out. Some people don’t get any that way, but they go to those who did get some and ask for some of theirs. CD: What is their sense of time? You describe something that happened a moon or so ago so they are aware of months - how about years...or days or hours? DE: They have a word ‘water’ which can refer to water or to a rainy season cycle – so I will come back next water means I will come back when the river has fallen and risen once, though no numbers are involved. A month is a moon. A day is a “fire” (one night and day about the camp fire is understood). No words for hours. CD: I was intrigued by Otavio - the Piraha who married into the Apurinas. Did he learn their language? How did he fit in with this (presumably) numerate and literate tribe? DE: He never learned more than a few words of their language. His wife learned to understand a lot of Piraha (though she spoke very, very little of it). He fit in because literacy, even for the one of the family that could read and do some numbers, these things had little to do with their day-to-day lives. CD: Why have the Piraha kept their culture whereas other Indians have integrated? DE: That is the first thing that made me realize that they are ‘special’ in some way. I believe it is because of (i) their own ethnocentricism and feelings of superiority and (ii) their value of immediacy of experience is violated by other languages, such as Portuguese. CD: Do you, or have you ever, felt tempted to just go and live amongst the Piraha permanently? DE: I have thought about that in the past. But then I realized that I would be a burden to them in the long run – I am a terrible fisherman and hunter. And I require more audio-visual stimulation – lights, drinks, books… So I am not as independent and self-sufficient as they are. CD: What do you like the most about the Piraha? DE: Their tranquillity and acceptance of life, their ability to bear pain and happiness equally. CD: What do you like the least? DE: Farting. This is not a social taboo for them and there are times after some meals that they pass more gas than the Alaska pipeline. CD: Whenever I've written about your book on my blog, I have immediately had people write to me referring to polemic papers. There seems to have been some controversy. Were you prepared for this? DE: Yes, I expected it. I knew that when I made my claims there would be others who wanted to deny them and who felt that I couldn’t possibly be right (about the scientific claims). But more and more studies are supporting what I have claimed and I will have a paper in the number one journal of linguistics, Language, in which I attempt to rebut all of these criticisms. 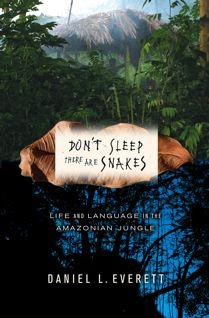 (American Edition of DON'T SLEEP THERE ARE SNAKES). CD: I have a nephew who is so badly autistic that he cannot speak, and until I read your book I'd explained his condition to myself as lacking what I've thought of as Chomsky's 'language centre'. Have you any views on how autism might fit in your new framework? DE: I think that there are connections. But I think that the problem of autism may have more to do with a problem with the social aspects of language than the grammatical aspects. CD: Is it possible for a non-Piraha to become fully-integrated in the Piraha's way of life? DE: Certainly not for me. And I have never seen anyone who has. It requires tremendous knowledge of the jungle and its flora and fauna, as well as toughness that one rarely finds among outsiders. CD: Is it possible for a Piraha to become fully westernised? DE: Yes. I know a woman kidnapped as a young child and raised among Brazilians who is now indistinguishable from those she lives with. CD: When I read the part that described how the Pirahas view the world as consisting of layers it brought to mind the shamanic view of the world - which seems to me to have some spiritual aspects. Do they have an idea of an underworld? Have they any ideas of where their spirits live when they can't see them? DE: When they cannot see the spirits they say that they can be anywhere – under the river, in the trees, in the sky. They let us see them when they choose. CD: What do they say about the stars and the moon? DE: They know a good deal about these. Once a Piraha man pointed to a moving object high in the night sky, a satellite (! ), and asked what that was. I said it was a thing like a radio. CD: Have the Pirahas changed in the time you have known them? DE: Nothing significant, except that they are being contacted much more now by some Catholic missionaries who think that they need more material goods. CD: Do you think global warming or environmental damage will impact on them? CD: What do they make of the Trans-Amazonian highway? DE: It is an invasion of their land, but the settlers along it have nice fields that the Pirahas can get things from at night. CD: Is there any other language that you have encountered that comes close to the strangeness of the Pirahas? DE: I have worked on nearly 24 other Amazonian groups and they all seem very, very different from the Pirahas. 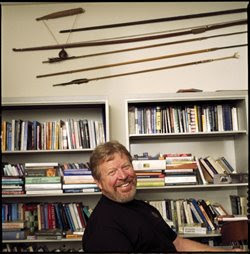 The world’s leading phonetician (Peter Ladefoged) had just visited the ‘Bushmen’ in Africa before visiting the Pirahas and thought that the Pirahas were much less like anything he’d ever heard of in his career (visiting and researching tribal groups around the world). CD: What converted you to Christianity in the first place? Was it your wife? Or the suicide of your stepmother? DE: It was my wife to be. And back in the 60s it was cool to be very different. Becoming religious made me very different from my hippy friends. But it was genuine and sincere and I did believe that Jesus loved me and had a plan for my life. CD: Do you regret losing your faith in God? Does it make things easier or harder? DE: I regret some of the social aspects of church – good times with nice people who share your world view – available anywhere in the world that you find yourself. I don’t have that now. But I do not regret anything about my views of God. They were unsustainable. I am happier now. But I never want my decision on religion to be seen as another form of evangelism. I am not out to convert people to atheism. These are hard personal choices. Interesting interview. I'm fascinated by the fact that the Pirahas stay in the present through their language and that they have no concept of numbers. Thanks for taking a look, Mary. Yes, the whole story is really interesting and unusual - so many things to think about as I read. Excellent writing, too! Thanks for sharing this interview and asking such great questions. Now I've got to read this book. There something so telling about the fact that these people don't have so many things (concepts, words etc) and yet they are so happy, so sufficient. A lot to learn from that I think. Missionaries should not be instilling their culture onto others. Daniel obviously had a conflict of interests, and decided for an academic career instead of an evalgelistic one. However, it is tragic that he had to sacrifice his faith in God! He lost his original mission. The conflict between loyalty to the original people and the imposition of the culture of Christianity is a difficult one. Just reading out Luke is not enough! There has to be common points to show that God is all powerful, and that Jesus is Lord and Saviour without taking away the joy and happiness and norm of their existence. The Gospel must be integrated and mostly "free" from the culture of the missionaries. We all have the same Creator! Thank you very much for your thoughtful comments, anonymous. Daniel gives us all a lot to think about. Good interview - must read this book. So interesting that Piraha seem able to filter out and reject concepts that don't fit their worldview so completely. Not surprising that Daniel's religious beliefs changed after spending time with them. With a language like birdsong and concerned only with the observable present it sounds like a fascinating culture. Thank you Anonymous. Yes, I recommend this book, very highly. It is extremely well-written and forces you to take a fresh look at the world around you. In a work that calls itself non-fiction, should quality of writing really trump truth? After all there are internal inconsistencies in the story, and contradictions with other accounts. I think there are real grounds for caution. I hope we'll see some more. Thank you, Anonymous, for the reference to the review -an interesting viewpoint, but having read the book I do not agree. I certainly did not find Daniel Everett's prose workmanlike, and found his writing perfectly vivid. I could counter that one sentence the reviewer has chosen with several others that convey the opposite -but what is the point? I really enjoyed the book and it made me think; maybe it will not touch others in the same way, but then we are all different. I came to the book as an interested general reader, Deborah Cameron is not - she is a linguistics expert at the University of Oxford - so our perspectives are different. And in answer to your initial question - no, I do not think quality of writing should trump truth in non-fiction...but then 'truth' is sometimes just as tricky as 'beauty' - frequently dependent on the eye of the beholder! Beauty yes. But truth too? I can't agree. For example: Is Everett's prose is "vivid" or merely "workmanlike"? That is indeed in the eye of the beholder. You have your view, the Guardian has theirs, and you can both be right at the same time. But on whether the Piraha do or do not communicate with outsiders, use foreign tools, or tell myths - do you really think that this kind of thing is just a matter of "perspective" too? That you could see the machete and I could deny its existence, and we could both be right in our own ways? I hope not! Yes, Anonymous I believe it is. All these things are not absolutes: what is communication - a smile or the spoken word? What is a myth? What is a foreign tool? Your definition may be different from mine, hence also what we consider to be 'truth'.